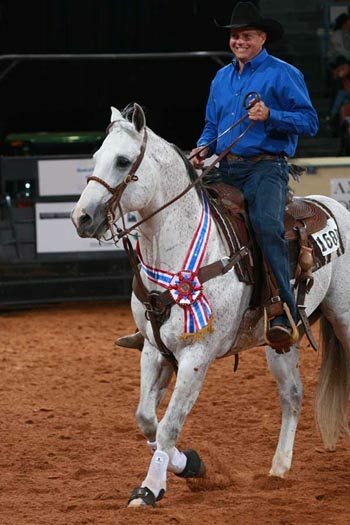 Apache Blue Boy (Blue Boy Doc x Apache King Miss) a 1995 grey Quarter Horse Stallion, recently won his fifth World Championship at the annual American Quarter Horse Association's World Championship Show held November 6-20th, 2010 in Oklahoma City, Oklahoma. In 2003, Apache Blue Boy won his first of five AQHA World Championships in Roping, with amateur exhibitor Mike Row in the stirrups. The stallion is owned by Row's father, John Row of Tishomingo, Oklahoma. Apache Blue Boy has two World Championship titles in Amateur Heading and three in Amateur heeling, but these only scratch the surface of his multiple top ten finishes a the World Show and year-end top ten finishes in heading and heeling. The stallion has earnings of over $76,000 from 50 AQHA classes. When he is not competing, Apache Blue Boy is busy tending cattle and breeding mares at the R & S Cattle Ranch owned by John and Mike Row.